The ARTeMIS Modal Damage Detection plug-in allows the application to start sending out notifications as soon as the Damage Detection data is changed. The trigger for the notification can be made due to some user action in which the Damage Detection settings have been modified, but also they may be send out automatically as soon as new data is imported into the project. Additionally, the user can filter the type of notifications that he wants to receive. button from the Analysis History Window. The following Notification Wizard will be displayed. 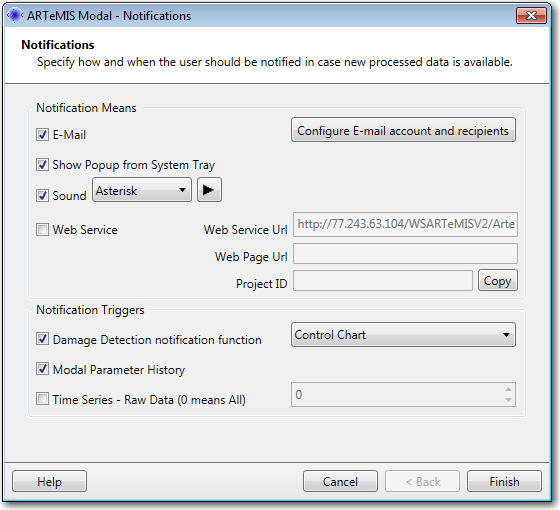 The Notification Means section is used to define the type of notifications to be send by the ARTeMIS Modal Damage Detection Plug-in. Currently there are four options available and it is up to the end user to select which one of them should be used. 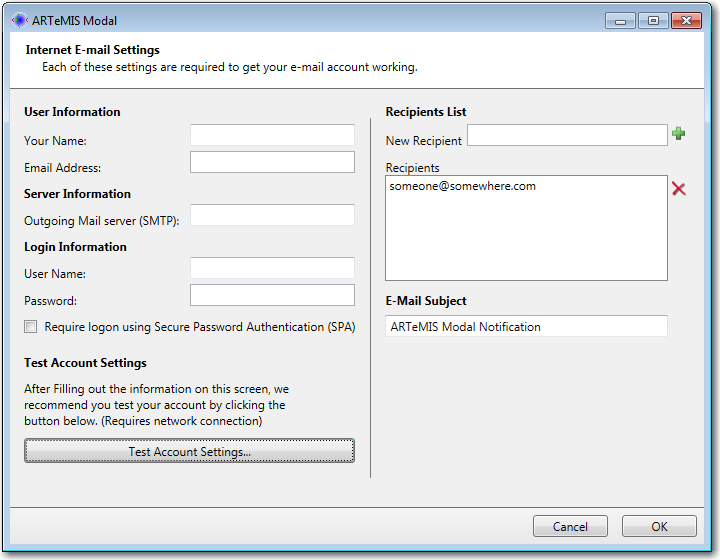 E-Mail: Send Email messages with predefined Subject and Body, containing the latest data change. Web Service: Specify the location to a Web Service implementing a predefined interface. Contact the support@svibs.com in order to obtain instructions for web service implementation. Popup: Show a popup from the System Tray. There are three types of Popup notifications. Depending on the critical level the popup can differ between Green (normal), Yellow (Critical) and Red (Not Safe) color. Sound: Play some of the predefined sounds. Control Chart: The notification will be triggered in case there is a change in the Control Chart. Since the Control Chart strictly depends on at least one of the Damage Detection methods, a change in the damage detection will trigger a change in the Control chart.